Like other integrations, you need to be an admin in order to enable the Webhooks integration. The Webhooks integration allows you to be automatically notified when something happens in Front without having to constantly poll the API. It also gives you access to a new rule action to set up a URL that will receive an HTTP request every time the rule is triggered. You can find documentation of the JSON format of the event here: http://dev.frontapp.com/#event-preview. Go into your Settings and select Integrations. Click Webhooks, and Enable integration. Click Save to finish enabling the Webhooks integration. 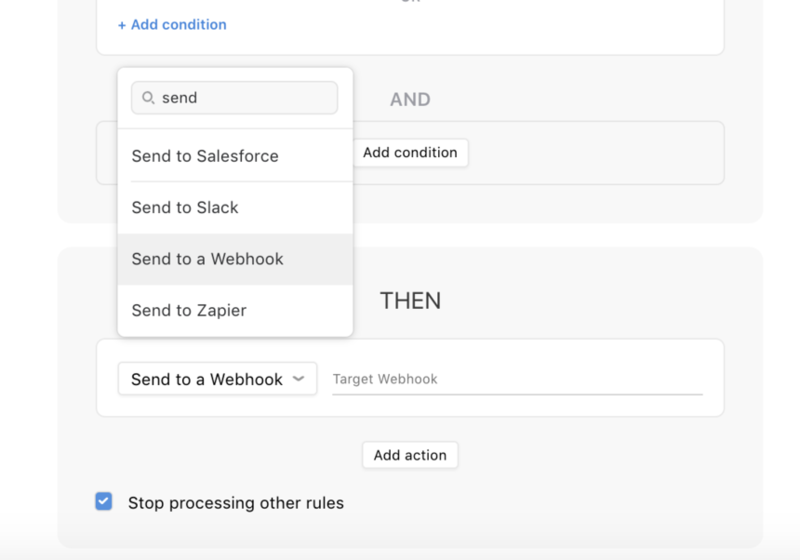 The Send to a Webhook option will now show up in your rules. i can't find send to a webhook option! Do you have the integration enabled? That must be done first in order to have the option in Rules. Hi! Thanks for a great product and nice upgrades like webhooks and Zapier beta. We are implementing custom workflows between Front, Zapier, Gsheets, Asana and other apps, for multiple companies. It would be awesome to trigger "send canned respons" using rules in Front on incoming webhook. Each rule could have its own hook url when selected. It would open up a lot of possibilities. Custom integration is not an option. Thanks! Can you clarify what you're trying to achieve exactly? It sounds like you want to be able to send canned response via rules, and that's currently possible. Please explain your use case if you can. The data format sent by webhooks is described at http://dev.frontapp.com/#event-preview. If you need more data, please request it using the API. Cori Morris , like your current outgoing webhook rule but for incoming. And in my case i would like to send a canned response from Front. We currently have a temporary workaround, which stores templates in google sheets, and then we just front to send. It would make more sense to use the canned responses that is already in front, it would simplify administration and iterations. If you wants to have a webhook for incoming messages, you can set up a rule to be triggered on incoming messages. Webhooks are not limited to outgoing messages. Additionally, sending a message using a canned response with the API is an improvement that is on our roadmap. Cori Morris no, i believe you have misunderstood my request. I want to post JSON to a Front Rule from eg. Zapier. Then i would like to populate a canned response with the JSON-data(with the same variables supported in the canned response). Nice to hear that you plan similar improvements to the API, but that would require Zapier to support that feature as well. By enabling incoming webhooks(as i request) to trigger a rule in front app is a more flexible and "applicable right now". Johan Frentz you cannot trigger a rule by posting JSON to Front. However, if you want to send a message with an HTTP request, you can use our API (cf: http://dev.frontapp.com/#send-new-message ). If you are looking for a solution specific to Zapier, you can use our Zapier app (cf: https://community.frontapp.com/t/806kca/how-to-enable-and-use-the-zapier-integration ). It looks like this covers outbound Posts, but what about inbound Posts Or Put commands. Can i send Frontapp an inbound command with webhooks. I'm trying to update contact and custom fields to sync contact data with other 3rd party softwares like our CRM. Our inbound webhooks are associated with messaging only. To update contacts' custom fields, please use the public API. Cori Morris i have set up a webhook to tell my url about front events, the url is being hit by front, but the post is empty. Deepak did you ever get this working? any content in the callback? Could you send us an email about your issue so that we can look into your specific rule and conversation to troubleshoot. Can variables be used in a webhook?